→Does Your Cat Have a Better Social Life Than You? Cats are mysterious creatures. Who knows what they’re thinking, where they go or, most interestingly, who their friends are. You may think that you are your cat’s number one best buddy, but perhaps your feline friend feels differently. Your cat’s social life is a mystery and an intriguing one at that. By nature, cats are solitary creatures who prefer to hunt alone and do not live in packs, unlike wildcats such as lions. 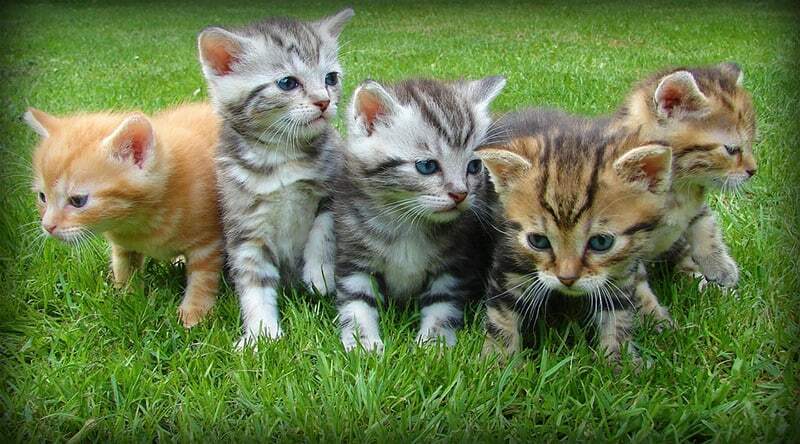 Whilst cats may be seen in groups, it is generally due to the availability of food or need for warmth, rather than a socially structured group. Dogs in the wild depend on their ability to hunt in a pack and work as a team to survive. Cats, on the other hand, are solitary predators. Their technique for catching prey is to stalk, wait, hide, and pounce, therefore more than one cat would be a disadvantage. When left to their own devices, cats tend to mark out territories which designate an area which belongs to them. Territory is established using scents from their facial glands, urine and feces, which explains why you often see cats rubbing themselves against surfaces. These territories help cats minimize conflict by warning away other cats from a specific area. A cat’s territory consists of a safe place for them to sleep, eat, play and interact with other non-threatening cats. If an unknown cat begins to encroach on a territory, it is likely to provoke an aggressive reaction which might involve chasing, hissing, growling, swiping and biting. Cats are first and foremost a product of their environment. Nature plays a role in dictating how they act, but we can see that nurture is at least, if not more, important. Certain evolutionary behaviors can be traced back to their ancestors’ habitat and cats nowadays are also influenced by their environment. Cats in the wild or living in feral conditions will mark out their territory and be mostly solitary. Their survival depends on being able to capture prey alone, and they must compete with other cats and animals for food, warmth and mating. The result is that these cats are less sociable, more nervous and tend to treat other cats and humans with suspicion. These types of behavior are necessary for their survival and reflect the environment they live in. By contrast, domestic cats are provided with food and shelter and do not need to compete with other cats for their basic needs. Therefore, they have evolved to develop more sociable tendencies. Whilst they might display some initial nervousness, they are much more likely to be friendly towards other cats and humans. This is particularly noticeable in pedigree cats, some of which have been bred specifically for their friendly dispositions. Cats who have been raised amongst people, other cats and pets tend to be more sociable and tolerant of contact. You might not notice it as much immediately because we are used to dogs and their exuberant forms of greeting, play and happiness. We also have a tendency to project human emotions and mannerisms onto animals, which may fit better with dogs than cats. When a dog wags its tail and opens its mouth, we recognize that as happiness almost akin to smiling and hugging. Whimpering dogs remind us of crying, and so we understand that behavior as sadness, loneliness or grief. Cats tend to be subtler in their interactions with humans and one another. A cat may nuzzle against your hand, touch their nose against you or tilt their tail as a sign of affection. Although none of these is as obvious as a dog jumping up on your lap and licking your face, they are still genuine signs of affection. If you’re lucky, you might even get a high five! A cat’s social life will largely be determined by whether it lives in a feral or domestic environment, although there are some commonalities across all cats. Cats’ social lives begin at birth with their mother and siblings. Their strong sense of smell is very important, as kittens can distinguish their own family nest smell from them of an unfamiliar family scent. Kittens will become distressed if they are removed from their family smell and placed with another. Even as cats get older, their sense of smell remains an important tool in distinguishing between other cats and even humans. Cats mature and develop different social lives depending on their environment. Feral cats tend to clump into groups if resources focus in one place, but if resources are sparse then they will spread out and live more solitary existences. If cats are living in a group, they will prefer to socialize with other cats that live nearby. In other words, who a cat spends time with is not random but is chosen. This is similar in domestic cats, who will have preferred cats that they tend to socialize with. These cats may live together or just live in close proximity. Cats which are familiar with one another may groom each other, play fight, sleep next to one another. This kind of extreme sociable behavior only tends to develop in domestic cats who have never had to compete for resources, as they do not view other cats as competition. 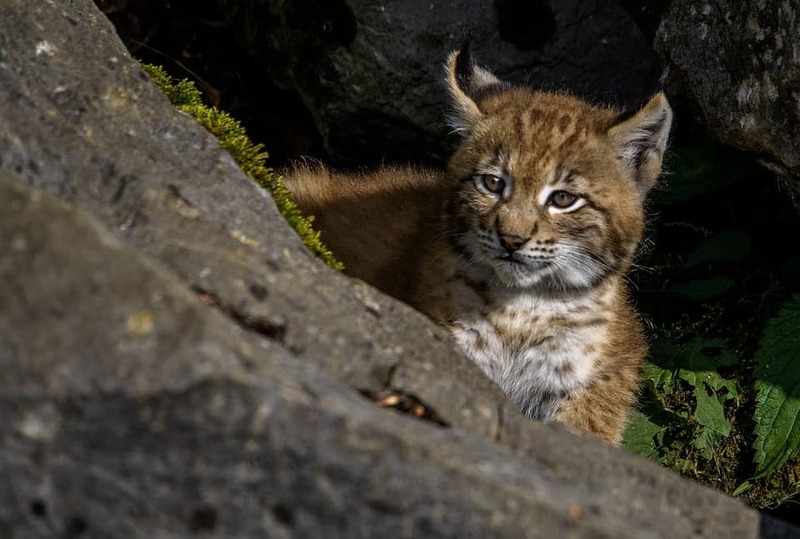 A cat may also develop a relationship with an animal of another species, which can be especially surprising when it is an animal they might view as prey in the wild. When their needs for food and shelter are met, cats do not necessarily view smaller animals as prey. This is why you might find your cat is a bit useless at catching any mice that get into the house- they’re just not hungry! 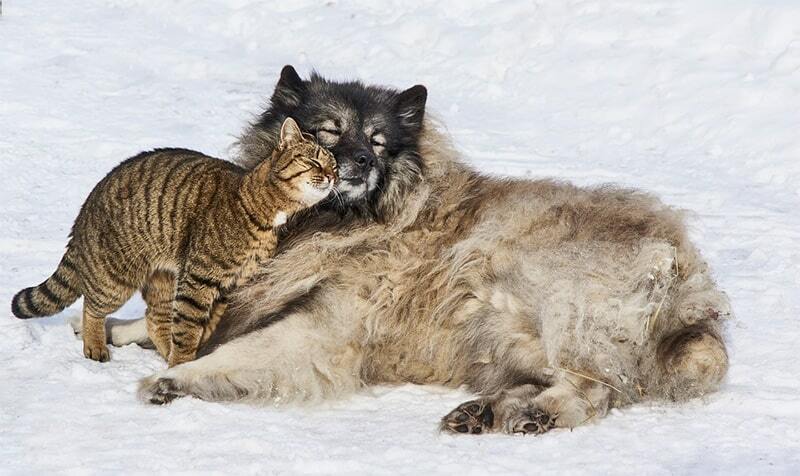 Despite stereotypes, cats often form relationships with dogs that live in the same house, and it is common to see the two cuddled up together on a cool winter night. Included in those other species are humans. A cynic would view any affection from cats as being motivated by food, but cats are able to bond with humans. This is very much influenced by early life experience. If cats are socialized with humans from a young age, they will exhibit social behaviors and bonding towards humans later in life. However, if a cat is not socialized with humans, particularly during the key period of 4 and 8 weeks old, they may never develop bonds with humans. Feral cats who do not experience much human interaction are unlikely to show affection towards humans, beyond begging for food and perhaps staying close for warmth. Research shows that cats do respond to several human cues, therefore bonding with humans. For example, if a cat encounters an unfamiliar object, they will be able to distinguish whether their owner has a positive or negative reaction towards that object. It is also suggested that cats can detect when a human is feeling down, and are more likely to interact with them in a soothing way, perhaps by rubbing or purring. More research is needed to understand exactly how much cats can understand human behavior, but so far it seems that humans are a big part of domestic cats’ lives. Your cat’s social life will depend hugely on its early life and the environment it exists in now. 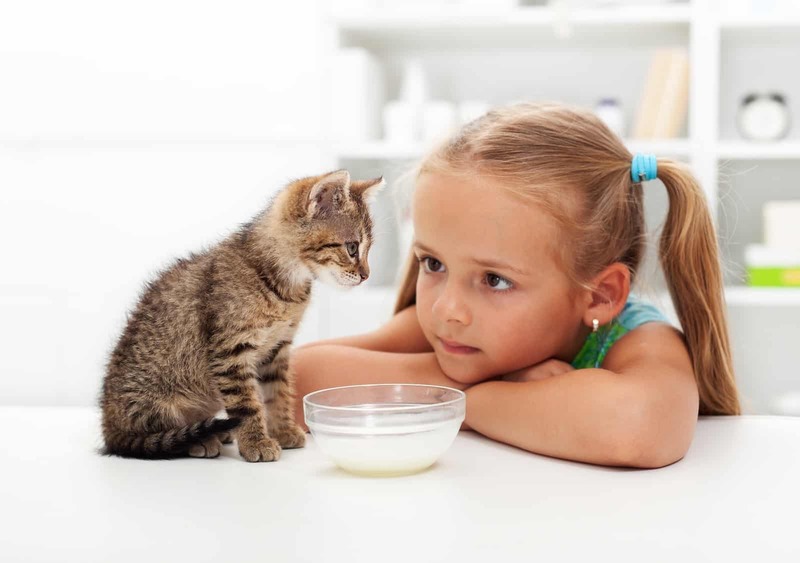 If a cat has all its basic needs met and is used to spending time with other pets and humans from a young age, it is likely they will form a big part of the cat’s social life. However, feral cats tend to be more solitary and only socialize if other cats are clumped close together for resources.